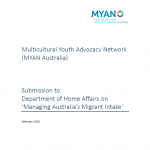 MYAN Australia made a submission to the Senate Community Affairs Legislation Committee for the Social Services Legislation Amendment (Encouraging Self-sufficiency for Newly Arrived Migrants) Bill 2018 recommending the Committee to not pass the Bill, and review the Bill with consideration of its potential damaging impacts on young people with particular vulnerabilities, particularly those from refugee or refugee-like backgrounds who may arrive in Australia with non-humanitarian visas. 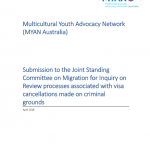 MYAN further recommended exempting vulnerable young people from any waiting periods for accessing social security benefits, and providing support for young people arriving in Australia with Orphan visa (subclass 117) and remaining relative visa (subclass 115) under the Family stream. Additional information to the submission can be viewed here.